Your home is supposed to be a place where you feel safe. Unfortunately, it’s not as safe as you think. This is especially the case for seniors. The fact is, there are many dangers lurking in your home, and any one of them could spell the end to your independence. Here are a few common senior hazards and how to fix them so you can live independently in your home for as long as possible. Over 80 percent of falls occur in the bathroom. This statistic shouldn’t come as a surprise because the bathroom is the one room in the home that is most likely to have a wet floor. Add to that the fact that you’re probably climbing in and out of a basin in order to bathe, and you should count yourself lucky if you haven’t fallen already! Not only should you keep the lights on to prevent a fall in the bathroom, so too should you take a closer look at the lighting inside and outside your home. It’s easy to trip and fall if areas aren’t properly lit. Make sure the hallways, bathrooms, bedrooms, and kitchen are all properly lit and consider plugging in night lights in the evening. Don’t forget about the outdoors! Keep walkways lit and make sure a light is always on in the garage. Not only will it help keep you from falling, having the lights on can keep intruders at bay too. It isn’t just lighting that can cause trips and falls. Many seniors have homes full of stuff, especially if they’ve lived in the same location for decades. All that stuff may bring back wonderful memories, but it can also mean having to move into an assisted living facility if it’s the reason why you experience a fall. Cut the clutter, which means getting things off the floor. If space is still a little cramped, consider getting rid of some furniture. Less stuff means fewer opportunities to trip. It’s not just the clutter in your home that can cause a fall. The flooring in your home could be to blame as well. Smooth flooring, like linoleum, wood, and ceramic tiles can be dangerous to seniors. Especially if you’re walking around in socks. If you have smooth flooring at home and you aren’t willing to install carpet instead, make sure you’re always wearing non-skid socks or house slippers. Rugs can pose a real problem too. They can easily slip under your feet, causing you to tumble to the floor. Large area rugs are usually okay, but smaller rugs should be secured to the floor, or you should skip using them altogether. Trips and falls are a serious risk to seniors, but burns can cause just as many problems. 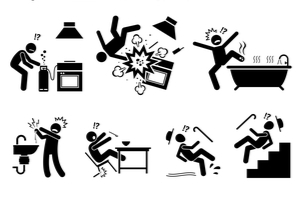 Cooking accidents are fairly common among older cooks who have shaky hands and shorter attention spans. To keep the stovetop from being a hazard, replace the gas range with an electric range. You should also choose a model with an automatic turn-off feature. Hot water burns can be a problem for the elderly, especially among those with diabetes who have a hard time feeling the temperature of the water. Make sure the water heater is turned down to 120 degrees to keep burns in the bathroom from becoming a problem. With the tips on this list, you can reduce the likelihood of experiencing an accident in your home, but taking these precautions can’t eliminate the possibility altogether. That’s where a medical alert system comes in. No matter what kind of accident you experience, a medical alert system can connect you with help right away. Check out our list of the best medical alert systems to find one that fits your lifestyle and your budget. By following these tips and using a medical alert system, you can live independently in your home for many years to come.